Owners of 2009 and 2010 Chrysler Dodge Journeys should be on high a alert of a potential design defect in the vehicle’s braking system. Our law office is noticing a pattern of increase consumer concerns and complaints relating to premature defective brake rotors and pads. The 2009 and 2010 Dodge Journey SUVs weigh approximately 3,800 pounds. Our research leads us to believe that the brake pads and rotors may be the ill-fitting (in terms of size and thickness) to handle the Journey’s weight and size. This will cause your brake to wear much sooner than normal and may potentially cause brake failure within the first 10,000 to 12,000 miles of driving. When you take your Journey to an authorized Chrysler service center for warranty work, some possible “band-aid” repairs may include: shaving/ resurfacing brake rotors and replacing brake pads. Remember to keep all your repair invoices to document your repair attempts. 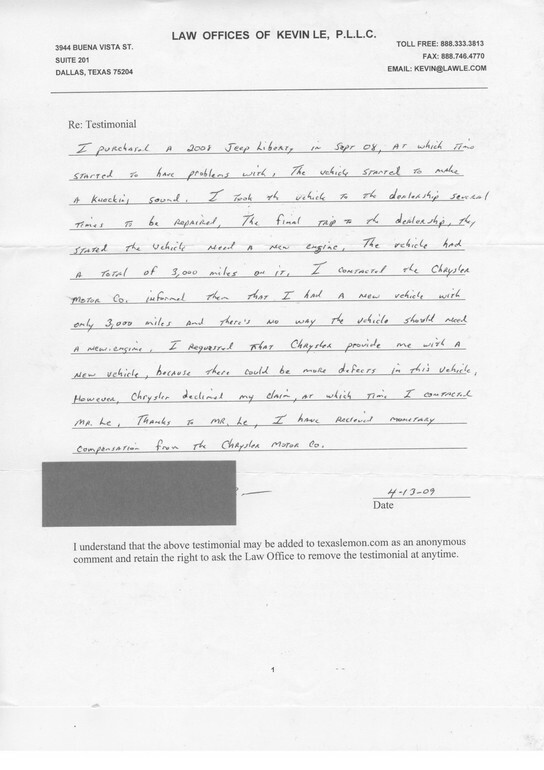 I am currently working on a Texas Lemon Law case against Chrylser and have been searching several databases for information regarding engine-related defects in Chrysler cars. I stumbled upon this frequently asked question (faq) document drafted in part by allpar and thought I will post a segment of the faq for those who may be interested in reading this information about Chrysler vehicles. Please be advised that this posting is not legal advice. Each case is different. If you suspect that you may have a viable new Chrysler lemon vehicle, then you should contact an attorney as soon as possible. Keep in mind that there are Texas Lemon Law statute of limitations. My Law Office is not responsible for any action, if any, that is taken as a result of this faq. When you read or hear the description of a new car,…the amenities and features flow by almost lyrically. Everything is couched in glowing terms that are designed by car marketing executives to sell you not just a means of transportation, but on an idea – a fantasy. You should expect your new car to function as advertised and to have all the amenities that are described, but what if the description does not match with the actual performance of the vehicle, thereby making it a lemon car?…and what if the description include terms made up by the automobile manufacturer? One phrase that you have perhaps heard in this context is “rich Corinthian leather”. The term “Corinthian leather” has been used by Chrysler in describing leather in some of its luxury cars since the 1970’s. It was first used in ads for the Chrysler Cordoba, The name Cordoba came from the Argentine Cordoba coin which was used as part of the logo for the car. In keeping with a somewhat Hispanic theme, the spokesperson for the Cordoba was Ricardo Montalban, Montalban is a Mexican born actor with a very lengthy career (going back to the 1940’s) and a smooth accented voice. One plausible story goes that during the filming of the commercials for the new Cordoba, Montalban improvised a bit and came out with the phrase “soft Corinthian leather”.